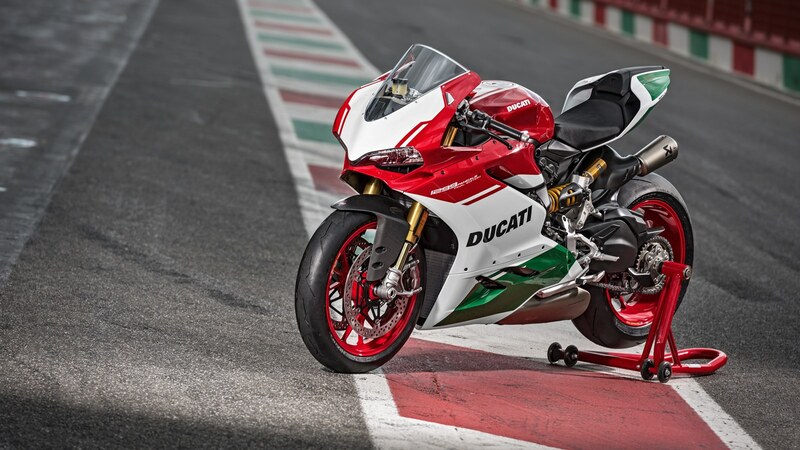 Ducati 1299 Panigale R Final Edition announced - last of the L Twins | IAMABIKER - Everything Motorcycle! An exceptional, exclusive bike, born out of respect and admiration for the engine that has made Ducati history and written the World Superbike Championship record books. The new Ducati 1299 Panigale R Final Edition is more than just a bike with a dedicated colour scheme or a limited edition. 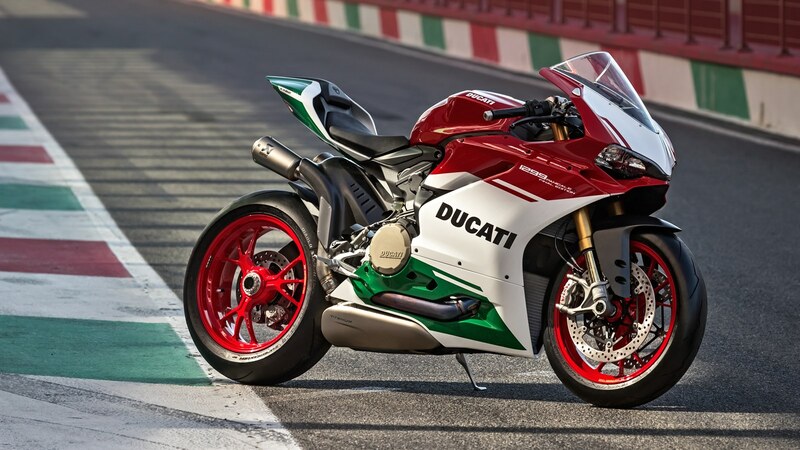 With a tricolour livery, as eye-catching as it is evocative, it offers a fitting tribute to Ducati’s iconic twin-cylinder power unit, which reaches its peak on this latest bike. For its world preview, Ducati has chosen round eight of the World Superbike Championship, taking place this weekend at Laguna Seca (California-US), where Claudio Domenicali, CEO of Ducati Motor Holding, unveiled the new Ducati 1299 Panigale R Final Edition together with Chaz Davies and Marco Melandri (the two official Aruba.it Racing–Ducati riders and stars of the awesome presentation video). This latest built-in-Bologna gem offers unparalleled technology, performance and design. 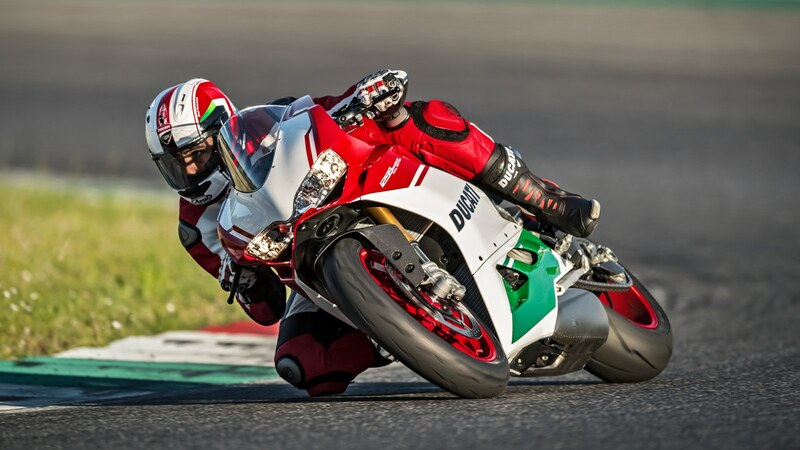 A Euro 4 compliant road bike, each 1299 Panigale R Final Edition is individually numbered. An offshoot of the 1299 Superleggera engine, the Final Edition Superquadro packs a 209 hp punch at 11,000 rpm and a torque of 14.5 kgm at 9,000 rpm. It features a lighter crankshaft with a larger crank pin and tungsten balancing pads, while the con-rods, like the intake-exhaust valves, are made of titanium. As on Superbike engines, the two 116 mm diameter pistons have just two segments and slide on steel cylinder liners. Developed by Ducati Corse, the ultra-compact monocoque structure incorporates the airbox and plays a pivotal role in containing the dry weight of the 1299 Panigale R Final Edition to just 179 kg (Wet weight without fuel). “I’m incredibly proud to present this latest version of our Panigale” stated Claudio Domenicali during the presentation. “Maybe no other motorcycle manufacturer has bound its name so tightly to an engine as Ducati has to its sports twin-cylinder. Today, we’re here to celebrate its history, just as we stand on the cusp of a new era in which our desmodromic system will be used on a new generation of V4 engines derived from extensive experience in MotoGP, a championship in which our engine has demonstrated outstanding performance. But that’s the future. Today, we want to pay homage to a twin-cylinder engine that – thanks to incredible torque and compactness – has seen Ducati win races in every SBK championship it has ever participated in. In short, it’s the engine that has written World Superbike history. From Marco Lucchinelli’s first victory on 3rd April 1988 with the 851 at Donington Park (in the first-ever world championship for modified production models) to the stunning 2017 wins by Chaz Davies and Marco Melandri on the Panigale R, Ducati has won no less than 333 races and taken 17 Constructors’ titles and 14 Rider’s titles”. And, to complete this historic moment, the Aruba.it Racing–Ducati team has decided to celebrate the arrival of the new 1299 Panigale R Final Edition by decking out its two official race bikes in the same special livery, to be used by Chaz Davies and Marco Melandri on Saturday in Race 1 and on Sunday in Race 2. Ducati India will start deliveries of the 1299 Panigale R Final Edition in September 2017 and the price will be announced shortly.